But before I answer, I want to address another question: Do 3-4 year olds actually need tennis lessons? Well, I don’t think they need tennis lessons. My opinion is that children who start tennis at 5-6 years old can be just as good or better than children who start at 3-4, and vice versa. It just doesn’t make a big difference. I’ve seen children who could hit the ball at 2.5 years old, but by 6 hadn’t progressed much. But as there is a demand in my area for this age group to do tennis, I provide the sessions. If the children enjoy the sessions and the parents are happy to pay, then it doesn’t do any harm. I’m always open with the parents and happy to tell them that everything we do in the sessions are things that the parents could do themselves – if they want to! 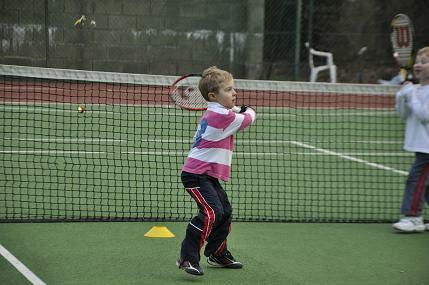 We don’t really teach tennis technique in these sessions – the children are just too young to learn it. The focus is on building all the skills which form the foundations of tennis (and pretty much all other sports). So running, jumping, twisting, turning, hopping, balancing, receiving, sending, co-ordination, agility…….all that good stuff. 1. I would suggest a ratio of 4 children to 1 adult. This doesn’t mean you need 2 coaches. You can have one coach running the session and a parent or two helping. Or a teenage helper. 2. You can do the warm up as a group. Something like ‘race cars’ where the children are running in different directions using a cone as a steering wheel. 3. You can try having them in pairs for most of the exercises shown in the video, but many children of this age are just too young to work in pairs. If it doesn’t work, just abandon! 4. As you have a ratio of 1:4 you can do all the exercises with you and your assistant feeding to the children one at a time. With that ratio, there is not too much waiting time. If you had a ratio of 1:8 the children would be waiting for ages, get bored, mess around and the parents might not be too happy with it. 5. There are some exercises which you can have all the children doing on their own. For instance, I use traffic cones – each child has a traffic cone with a ball on top. They hit the ball off the cone at the fence. Every time they hit the fence, they run to get a little cone – this is like scoring a point. Here are some other good youtube vids with exercises for this age. Remember you can use bean bags / balloons / big balls instead of tennis balls. This one’s great! Little kids will love this. 1) Use bean bags instead of balls. When you say bungee, the kids jump, trying to keep bean bag on racket. 2) Use a ball, but placed in the throat of the racket. 3) When coach says ‘drop’, the kids drop the ball from the racket & trap the ball under the racket. Overarm throwing. I often do this with bean bags as you can make it a competition – as the bean bags are different colours and stop where they land, you can see whose bean bag went the furthest. I also have a game where the group is all standing in a line and the coach runs past – all the kids try to throw their bean bag at the coach. Flipping pancakes – bean bags on rackets, trying to flip them over. Hula hoops – kids try to throw their bean bag into partners hoop – or flip it from their racket into partners hoop. Or there is another exercise where you roll the hula hoop along the ground and the child runs after it and tries to throw a ball through. This needs coach / assistant feeding of course. This list could go on so I’ll stop there. I’m sure you can use your imagination and come up with plenty of ideas. And of course youtube is a great source of ideas. I’d love to hear your comments, ideas and questions in the comments section below. And if you enjoyed this article, please share it using buttons below. Very good points. May I suggest you take a course on concussions. No matter how light that ball is, bouncing it off a child is a potential problem and unacceptable. Good job on the rest of the presentations. and keep up the good work growing tennis. Loved your video and my students love some of these drills. -I have a question for you… I have a 3 year old girl who gets very angry and upset when she cannot hit, stop or roll the ball, she will literally start crying and will not want to play anymore. What I try to do is change the exercise or give her other drills that do not involve the net where she wont get frustrated. Any other ideas with how to deal with this??? 1) Juggle scarves – love these – the kids can run and catch them, hit them, catch them on their rackets – even 2 year olds can catch them. 2) A batting tee – originally for baseball, but great for tennis as well. Put the tennis ball on top and the kids hit the ball off it. I go a step further and put a couple of spots exactly where their feet should go. When you put the kids in the right place, its almost impossible for them to miss when they swing. You can actually use witches hat cones for this as well. Get the kids to hit the ball off the cone. 3) Balloon balls – again, wouldn’t be without them. They kind of float, but bounce like a ball as well. You can feed it right onto her racket so that, again, it’s virtually impossible to miss. Amazon.co.uk sells it. Can’t find them for US but beach balls are a good alternative. You can also feed her a volley – just a push volley where you feed it straight to her racket – if she pushes her racket forward, she’s almost bound to hit the ball. May not be proper technique, but gives her some success. Finally, I would say there is a place for a little bit of firmness as well, and involvement from Mum – I always ask the parent to stay with this age group. Good luck! Hi Marissa. Thanks for your question. It’s a bit too much too answer here. They are very different ages and I don’t know their abilities. I would suggest getting a lesson or two, but you could be involved so you know what the coach is teaching them and can then reinforce it when you work with them. Also, there are a couple of good sites where you can pay a little bit of money and see lots of drills and teaching methods. One of those is Webtennis24. He actually films whole lessons with children so you see everything he does. I also like Modern Tennis International. They have a very simple but effective system for learning tennis. I think you can subscribe and watch their videos online or buy their videos and ebooks, which contain step by step methods to learn all the tennis shots. Sorry not to help more, but it would probably take a few hours to describe what I would do on court with these age of children. Good luck!